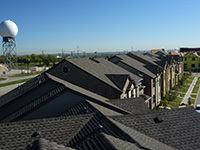 Ensure the structural integrity of your property’s roof by allowing the Dallas, Fort Worth, Arlington, Waco, Temple, Killeen, Austin, San Antonio, and Houston commercial roof maintenance experts at MEIS Roofing & Construction to provide you with a free inspection. Our team guarantees your satisfaction, and you’ll be notified of all work and repairs before we perform them. We can cooperate with you to create a roof maintenance schedule that meets your needs; we will go out of our way to avoid disrupting your day-to-day business operations. From storm damage to drainage issues to sagging roofs, we can quickly correct problems and ensure that your building’s roof is stable, leak-free, and functions properly. We will do our best to catch any potential issues before they grow into bigger problems. 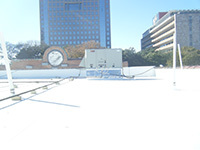 Because we deal with all commercial roof types, we can make repairs quickly. We commit to making repairs that last, and we will gladly stand behind our work and our products. We choose each one of the roofers on our team based upon a number of criteria, including dedication to customer service and a commitment to excellent quality. Our roofers are some of the best in the industry, and we’re backed by accreditations including multiple A+ ratings from the Better Business Bureau. We never leave a mess behind, and you can have peace of mind in knowing that our roofing company is backed by a two-million-dollar insurance policy and that all of our roofers are protected by workers’ compensation insurance. You can trust our professional roofing technicians to survey the damage, formulate a working plan, and conduct needed repairs. When it comes to commercial roofs, a trained eye will notice any issues from the exterior of the building. Our experienced technicians can walk around the building, examining the surface of the roof from the ground before they climb up and perform a more thorough check of the roof. They will be able to find any telltale signs of any damage, roof leaks, or mildew growth. All of these issues need to be taken care of promptly to ensure the damage does not worsen. If more damage does occur, the cost of a roof repair or a new installation will be greater than that of a simple maintenance job. At MEIS Roofing & Construction, we can schedule regular roof inspection appointments to ensure your new roof is withstanding the test of time and extreme weather conditions. We certainly do not want mold, mildew, or leaks forming. While the majority of roofing issues will be immediately noticeable from the exterior of the commercial property, the interior is just as important. Inside the attic space, our expert roofing technicians can monitor for any leaks, water damage, mold and mildew growth, or broken fixtures from the roof. In some instances, such problems are only easily noticed or traced from the inside. 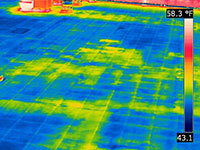 Your roof may take a lot of abuse over time, especially from the weather conditions outside. Excessive rain, hail, and high wind can easily damage a roof in a short period. It is important to maintain your roof properly. By calling the professionals at MEIS Roofing & Construction, we can ensure the structure we installed remains intact and efficient for some time to come. If you are unsure of how to perform a roof leak inspection from the inside, let the experts at MEIS Roofing & Construction handle the situation. We can revisit your location periodically to ensure no damage has occurred. If you find a leak in your roof, you should address the issue as soon as possible. Before you begin excessively worrying about the cost to replace the entire roof, you should know that the expert roofing technicians of MEIS Roofing & Construction could quickly patch a simple leak in your roofing material. 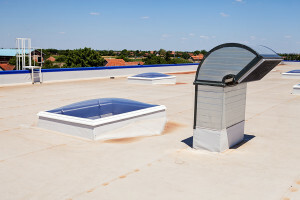 If a significant portion of the roof has been destroyed past its useful service life, a new roof may be the only method available to solve the problem. Our technicians will survey any and all damage and determine what options you have. More often than not, we can use state-of-the-art tools and extensive training to fix a roof leak without problems. To ensure that your business’ roof is protected, call us today at 866-211-1116 for more information or to schedule a free inspection & estimate.